You may recall my account of finding what I thought to be a bronze bangle lost by Queen Boudica when she visited Grove Farm for lunch many centuries ago (see below). I was convinced that my analysis of the event would be totally accurate but I felt that an endorsement of my story by the experts at Norwich Museum would help to quell any doubts that the more sceptical of villagers might dare to express. Anyway in pursuit of this aim I sent off a photo of the bangle for an opinion and I am sorry to report that a whole 30 minutes elapsed before a reply was received! 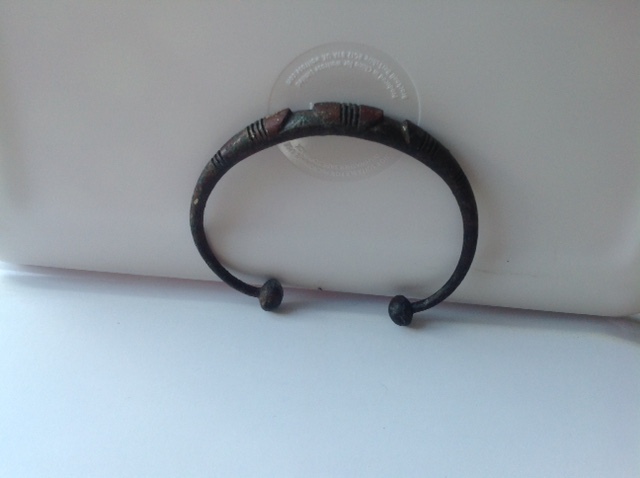 The information supplied by the museum was that they considered the bangle to be of 20th century manufacture and probably or African origin. I was initially happy with this second opinion but since that time I have carried extensive local research by contacting three or even four older parishioners and none of them recall any Africans in the village during the period in question. This survey may leave doubts in your minds about the expert opinion received but I think we just have to accept that Shotesham no longer possesses the bangle of Queen Boudica herself but possibly one of her later African descendants! The television programmes these days seem to include a multitude of transmissions on very similar subjects. We are all familiar with the vast number of cooking and food subjects and the attention given to house buying and property issues. I would like to draw you attention also to the large number of archaeological programmes available. For the purposes of this article I would like to remind you of “Time Team” in which Tony Robinson and his team did numerous digs in UK also including nearby Caistor Camp. Those of you who did watch this programme will be aware of the number of occasions on which a small fragment of pottery was found and within two shakes the talented artist Victor Ambrus produced a drawing showing every aspect of the pot from which it came. The same applies to his wonderful drawings of villages and people milling about among round houses quite obviously in the same clothing and occupations that they had in the time when they were living. Such an episode occurred for me only the other day. My wife and I were clearing an old bonfire site when just off the edge of the area of our excavation an object appeared in the disturbed earth. Eagerly picking it up it soon became obvious that it was a bronze bangle of indeterminate age but so heavily encrusted with soil products that it might have lain there for centuries. After cleaning and closely examining the find the source of origin became obvious to me in a flash of inspiration. The bangle was found immediately behind our very old house and this spot can be seen easily from the far side of the valley across the beck where, of course, sits Boudica’s Way. There is little doubt in my mind that at some time in the past Queen Boudica was passing along that road in her chariot,which must have been hazardous for the dog-walkers of the time with those dirty great swords sticking out of the wheels an’ all ! She probably watered her horses at the beck from where she would see the attractive meadow across where she could stop for lunch. 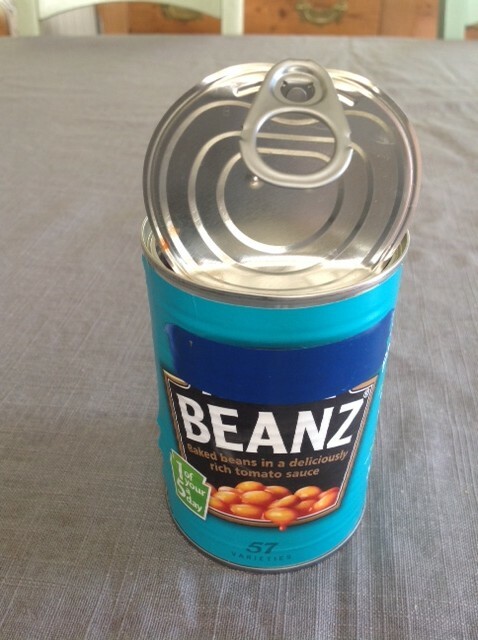 It follows therefore that while she was trying to open her can of baked beans with her sword ( she probably hadn’t noticed the ring-pull on the tin(see reconstructed photo. )that the effort caused her bracelet to become dislodged from her wrist and hide itself in the grass. She must have been totally distraught when she later became aware of her loss. I found it quite easy to establish the accuracy of my hypothesis for on close examination of the inner surface of the bangle some scratch marks were found.To my trained eye and after a long assessment it was a clear inscription ” Boudica her bracelet” and also in total confirmation ” Made in Icenia” What could be more convincing ! 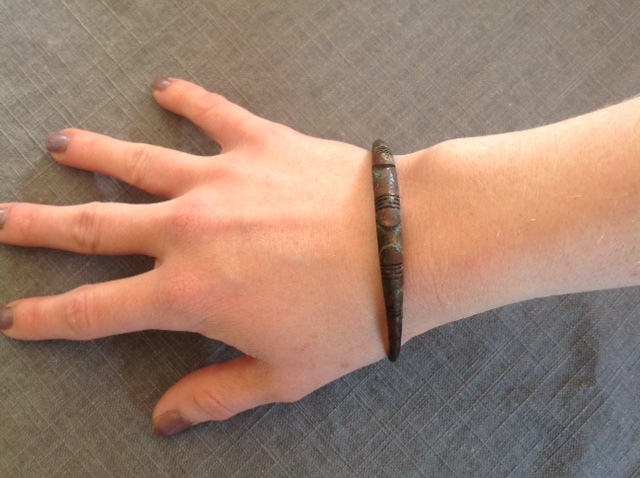 To summarise therefore we are in possession of Queen Boudica’s bangle in bronze ( see photo. of the bracelet on a mighty warrior’s hand ) The nail varnish colour is called Elephant’s Breath!!). We will shortly be offering this for sale through a major auction house but offers from Shotesham residents will be considered to keep it in the family. I suggest that a starting bid of £500 might be appropriate.